Echoes of the Fey is a visual novel by a pair local developers in the St. Louis game development community. It's astonishing that they were able to do the majority of the design and development work on this project on their own with just the two of them. 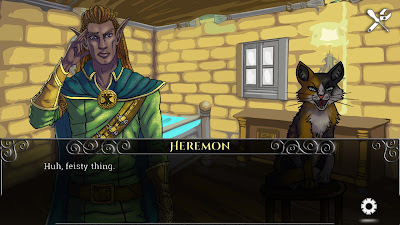 I had the opportunity to throw some questions at Jenny Gibbons and Malcolm Pierce, the duo behind Echoes of the Fey, asking them about the development history of the visual novel, what makes the genre so compelling, and other odds and ends. Phil Stortzum (PS): Who is the team behind Echoes of the Fey, and what were their positions and general duties with the game? Jenny Gibbons (JG): The team behind Echoes of the Fey consists primarily of myself (Jenny Gibbons) and Malcolm Pierce. Malcolm came up with the original story idea for Echoes of the Fey, and we both thought it would be a good fit to develop together as a new Woodsy Studio game. We initially worked with a great new artist to draw the concept art, but she wasn't able to stay on the project. I took on all the art after that, as well as the music and initial programming. Malcolm worked on most of the script, and then tackled the process of importing it into Game Maker. From there we juggled tasks as much as we could, and hired out voice actors! PS: What can you tell SuperPhillip Central’s readers about the story of Echoes of the Fey? Malcolm Pierce (MP): Echoes of the Fey is detective story that happens to be set in a world of high fantasy. The setting is the continent of Oraz, which is divided in two by a Great Forest. Humans live on one side, Leshin—the proper/preferred term in our world for Elves—the other. In the months after a long war between these two peoples, our protagonist, Sofya Rykov, is a private investigator who uses her magic powers in secret to solve mysteries in the border town of Vodotsk. 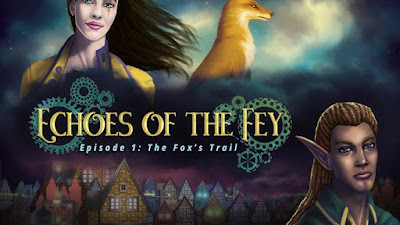 PS: Echoes of the Fey is being released episodically. How many total episodes will there be, and what is the timing for release of the other episodes? MP: To be completely honest, we don't know how many episodes we'll write. While each episode will connect via certain plot through-lines, they are generally stand-alone mysteries. We see the episodes more like episodes of Sherlock rather than episodes of, say, The Walking Dead. Character circumstances may change. They may rise or fall, their relationships may become close or unravel... But at the end of each episode, Sofya will be ready to solve another mystery. The numbering is largely to ensure the between-episodes threads make sense to a new player. As for timing, we're working on that now. We're considering a short, free prologue that would be out sometime in the winter—an Episode Zero, if you will—and beyond that I've already started work on outlining the next full installment, which we'd hope to have done in the spring. PS: What benefits does having a visual novel have over a real novel? What advantages does telling a story in a visual novel have over doing a different type of game, say, an RPG? JG: The most exciting element of a visual novel is that the players have an active influence over the story. By making certain choices throughout the game, they help craft the story. Writing multiple branches of a story is more work than a traditional novel with one ending, but it's very rewarding as an author to see how players respond. It is like watching your story come alive and grow into something greater than you first imagined. The biggest advantage of visual novels over other games (like an RPG) is that the story is the primary focus, and that's okay. Gameplay needs to be altered so that it helps the story; not the other way around. We like to make the story our number one priority. 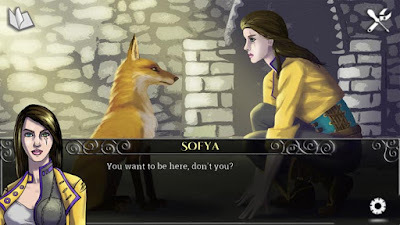 PS: What do you think makes visual novels so compelling to players? MP: More than any other type of game, a visual novel has to have an engaging story and interesting characters. That's because the story and characters are the gameplay. The fun part of playing a visual novel is seeing how both react to your choices. If you don't care, then the game won't keep you coming back. PS: What games, fantasy series, films, stories, etc. have contributed to the inspiration of Echoes of the Fey? JG: Our initial concept set out to be different from anything we'd seen before, considering that the tone would blend high fantasy with mystery and steampunk motifs. We also wanted to take characteristics often given to well-rounded male heroes and give those to a woman instead. That said, we were heavily influenced by other mediums once we started working on the project. Malcolm drew some inspiration from Terry Pratchet's novel "The Color of Magic." We also got into the "Saga" graphic novel series shortly after we started development, and that was a huge inspiration both on the story and overall aesthetic. Musically, I drew a lot of inspiration from "Legend" and the way it blended soft synth music with a dreamy fantasy world. I spent a lot of time listening to musicians like Tangerine Dream and Vangelis while working on the game. PS: How long has development been on Echoes of the Fey? MP: Approximately one year. Keep in mind, this included the development of our VN system (which was built off of a module called EdgeVN, by Thinkboxly) and when we started, Jenny was the only one who knew anything about GameMaker, or coding at all really. Future episodes should be able to be produced faster. PS: What were the biggest problems regarding development of Echoes of the Fey? How did you go about solving them? JG: For me personally, trying to balance a full-time day-job with working on this game in my free time presented the biggest challenge. To that end, it was also very difficult (both practically and emotionally) when our artist left the project just a few months into development. But Malcolm took on more and more of the work tasks as I took over the art, and we were able to keep up that balancing act for the rest of the project! Otherwise - in terms of basic game development - I'd say the biggest challenge we faced was trying to make a visual novel in Game Maker, which felt very unnatural at first. Fortunately, as Malcolm mentioned before, we were able to purchase another programmer's plugin engine that provided the foundation of code we needed to launch forward. PS: Is there anything not in this first episode feature-wise that you would like to include in future episodes? MP: This was our first VN in an engine other than Ren'py. Don't get me wrong, Ren'py is great for creating visual novels. If that's all you want to do—tell a story with visuals and music and branching paths—go ahead and stay with it. But from the beginning we knew we wanted to do more, and add more game systems. 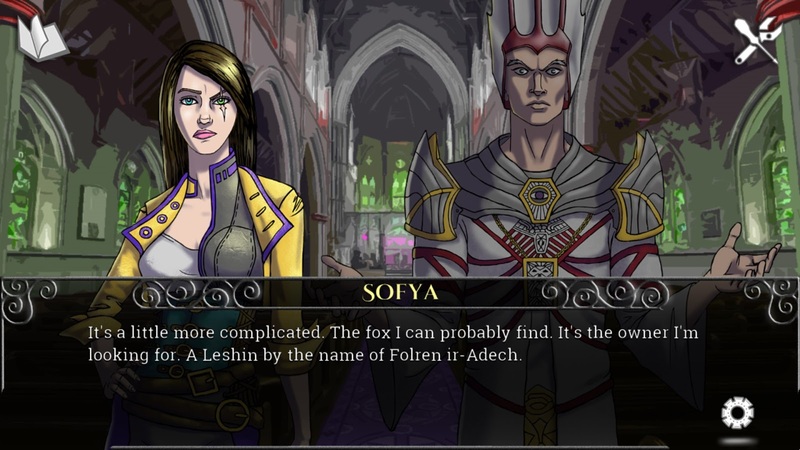 In the first episode, The Fox's Trail, this manifests with side-scrolling sections that represent the city where the investigations are taking place. But now that we're both way more proficient with coding, we're hoping to add deeper systems. I can't promise exactly what those are, but I can say that we're beginning to experiment with some game-within-a-game ideas. PS: There is a relationship system in Echoes of the Fey that changes certain elements of the story. How was this implemented to work well? JG: That's an interesting question for this story, which can't be answered in great detail without dropping spoilers! But I will say this: in Echoes of the Fey, the pursuit of character relationships through side quests is optional, but also has a strong impact the main plot. By spending time with some characters, you find clues that will help you solve the central mystery. We wanted the plot to feed the character development and vice versa. Towards the end, your relationship with other characters determines whether they will help you out when you need support! PS: How do you go about making the choices players make feel like they’re actually proactive in engaging with Echoes of the Fey rather than just feeling like they have no power and are just going through the motions? MP: Choices are a double-edged sword. On one hand, we want to tell a compelling, fully-formed story. 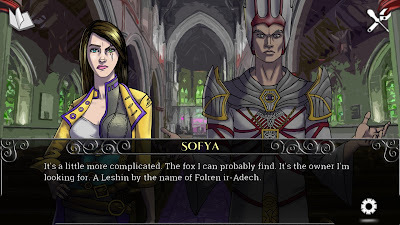 We want our player-character, Sofya, to have a personality of her own rather than simply be a cipher. Too many VN protagonists are blank slates. Sofya is a disgraced noblewoman and war veteran who hides her physical scars with magic and her emotional scars with overcompensated optimism. So all the choices—and there are a lot of choices—have to be things we believe Sofya might actually do. Fortunately, she's also (more than) a bit capricious. One of the tools we use to make the choices feel meaningful is information. Certain choices reveal a lot more about the world—and the case—and thus provide the player with information. Other choices are about sharing that information. Since Sofya is a private investigator, she tends to uncover secrets about the characters around her. Revealing certain information to others can drastically affect where those characters end up by the time the credits roll. PS: How are you encouraging replay value with Echoes of the Fey, or is it intended to be a go-through-it-only-once experience? JG: Assuming that you see all the side quests on your first playthrough, the primary replay value of Echoes of the Fey comes from the last third of the game. After uncovering the mystery, the player has to make big decisions regarding what to do with the discovery. Do you tell everyone you know the truth, even if doing so causes someone harm, or do you lie about it? Do you tell some people and not others? There are several ending variations depending on your choices throughout the last third of the game, and you can only choose one character to help you deal with the consequences on each playthrough. PS: Are there any parting thoughts or something you’d like to say to SuperPhillip Central’s readers before we finish here? MP: If you enjoy stories in video games and you've never tried a VN, you should give one a shot. A lot of people think of them as a purely Japanese phenomenon, but there's a rich history of interactive fiction in the so-called west, from the trial-and-error text parsing of Infocom titles to the wacky puzzles of classic Lucasarts adventure games, to the janky-but-ambitious work of David Cage. A good story can be told in many different formats, and games are too often overlooked on that front. And if you are interested in Echoes of the Fey after reading this interview, look no further than the game's Steam page to download the title. My thanks to both Jenny Gibbons and Malcolm Pierce for their responses to my questions. Stay tuned to SuperPhillip Central for future interviews, whether for small or large devs, or someone anywhere in between!